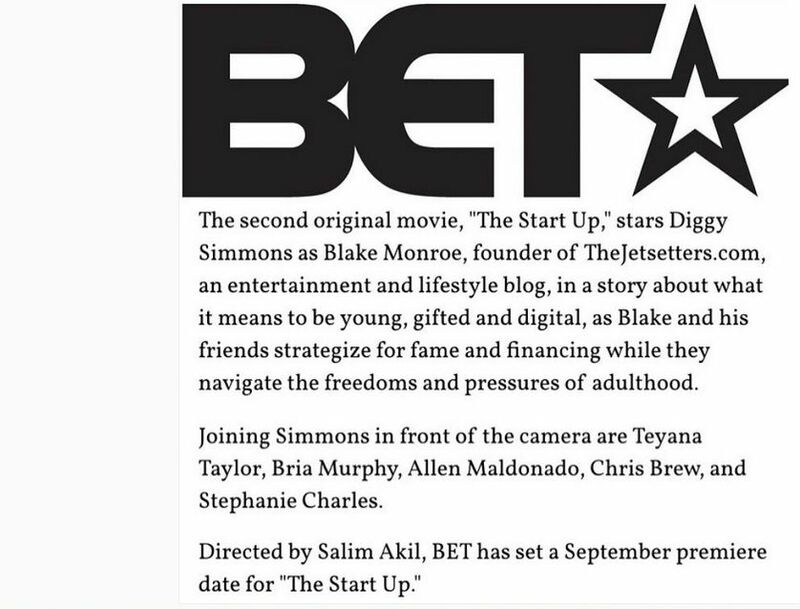 BET’s “The Start Up” Finally Has a Release Date! No lie, the buzz about BET’s new scripted comedy The Start Up has been circulating for two years now. When the news first dropped back in summer 2013, it was set to be a movie and had a lineup of different actors (except Diggy — he’s always been on deck to star). Then, in 2014 BET hinted that it would be a series and this year, it was back to being a movie again. And until a couple of months ago, it seemed like the whole project had fallen off and been scrapped. But then, around 4:00 this afternoon (July 30, 2015), Diggy took to Instagram to let everyone know that an official release date — September 19 — has finally been scheduled! The cast includes Diggy (of course), Teyana Taylor, Bria Murphy, Allen Maldonado, Chris Brew, and Stephanie Charles. How excited are you? Will you be watching? Tell us in the comments below!